Momas and Dadas: New Genres Project House is pleased to debut a collection of historical pirated video work by 10 influential artists, never-before-seen in Las Vegas. 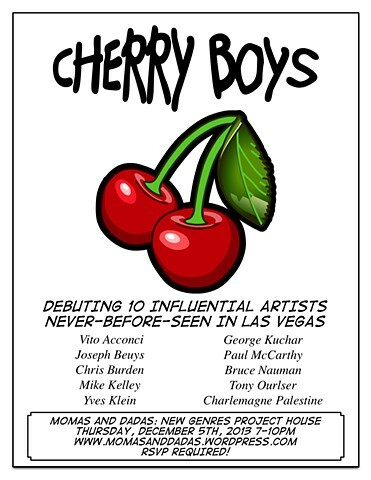 Acting as a supplement, rather than an alternative to the gender biased trope, currently circulating the Vegas scene, ‘Cherry Boys’ pays homage to a handful of powerful, intelligent ‘people’ who have influenced contemporary art, as we know it today. Video screening hosted by Artist Michael Barrett.